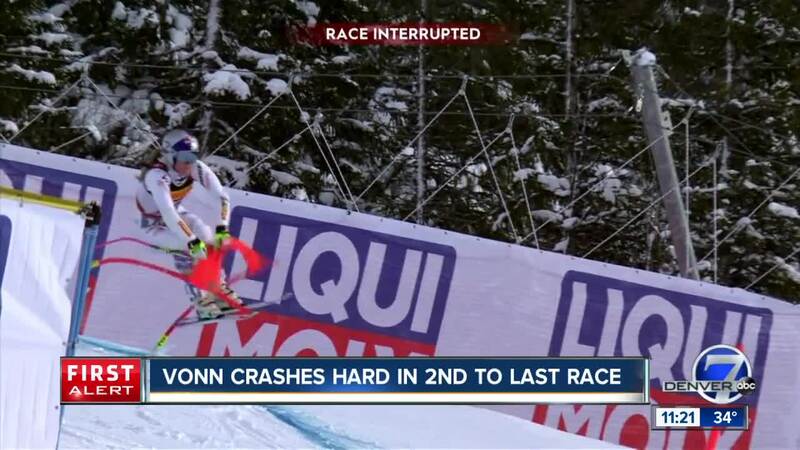 (CNN) -- It was supposed to be a happy farewell, but Lindsey Vonn crashed in her opening race at skiing's World Championships as compatriot Mikaela Shiffrin triumphed in Sweden. The 34-year-old Vonn flew off a jump and careered into netting in Tuesday's super-G, the penultimate race of her glittering career after announcing her retirement last week because of the toll the sport has taken on her "broken" body. Vonn later told a news conference she still intends to compete in Sunday's World Championships downhill before hanging up her race skis. The American has won 82 World Cup races, second on the all-time list behind Ingemar Stenmark (86), and is the most successful women's ski racer of all time. "I'm just trying to accept the position I'm in and move forward with it," she said in Sweden. "The last two races probably won't be my farewell season I wanted and being able to break Stenmark's record. But the 23-year-old held on to beat Italy's Olympic downhill champion Sofia Goggia by 0.02 seconds with Swiss Corinne Suter 0.05 secs back. Shiffrin has been the standout women's skier this season with 13 wins on the World Cup circuit to climb to 56 victories overall, making her the fifth most successful ski racer of all time. "She's mentally tougher than anyone else, she trains more ... she does everything well and you're seeing the results," American ski great Bode Miller told Eurosport, referring to runaway World Cup standings leader Shiffrin. Vonn said in October that this season would be her last but a knee injury in a training crash at Copper Mountain, Colorado in November put back her season debut until January. She struggled with knee pain in two races in Cortina d'Ampezzo, Italy and after much soul-searching she announced Friday she would retire after the World Championships. She added in Are: "I was pretty clear after Cortina my body is not going to continue doing what I wanted it to do. I didn't want to end in Cortina, I thought that was not the way to go out. "I wanted to say goodbye to everybody. It's been really nice to get all the messages from my fellow competitors and coaches and all my friends that have supported me for so many years. It's been really heart warming for me and makes the process of retiring a little bit easier, maybe." Writing on Facebook last Friday, Vonn said: "The past two weeks have been some of the most emotionally challenging days of my life.